Without a doubt, planning a trip to southern Africa is an exciting challenge, but at times can be very frustrating. The region has such an array of options with regards to what to do, where to go, how do we select accommodations in Cape Town and where should we go on safari. For many, it is really difficult to know where to start! And then you need to decide whether you should select a scheduled guided-group tour or a custom-designed private tour? You may ask yourself: What is the difference between tailor-made travel and group travel? Tailor-made safaris are the way to go for the independently minded, savvy traveler. In general, they offer the ultimate in flexibility. Guests can travel where they want, when they want and how they want. Through an interactive process of consultation and discussion, we will work with you to design the best itinerary for you and your family and friends. Once on safari, you have plenty of opportunity to interact and dine with other travelers at individual properties, and resident professional guides ensure that guests are graciously hosted and expertly guided at each safari camp or lodge. But when it is time to move on, you go your own way, without a full-time professional guide, and you continue with your customized itinerary. You are not traveling with a group, so there is no need to fit in with anyone else’s schedule. The principle advantage of a scheduled-departure safari is that a small group of travelers shares certain fixed costs (e.g. transportation and a specialist guide), thereby decreasing the per-person price of a trip. In some instances this makes scheduled safaris a good choice for the more budget-conscious traveler, but it also facilitates some very creative itineraries that would otherwise be prohibitively expensive. The key features of our scheduled departure safaris include a full-time professional guide on tour with you, except at the safari lodges when you are hosted by rangers, and group tours that focus on the region’s top highlights and best game-viewing areas. Group size is small. We try and limit our groups to a maximum of 16 travelers and minimum of 6. No need for you to worry about doing the driving yourselves, this way you have more time to spend game viewing and taking lots of photographs. As a Southern Africa tour specialist, we deal with a lot of different tour operators, lodges, hotels and guesthouses. Quality of accommodations is important, and based on previous tours, regular scouting and clients’ feedback, we are always monitoring and updating our portfolio of information, so that we have the most current and best available. BELOW ARE A FEW POINTS AFRICA EASY TAKES INTO CONSIDERATION WHEN PLANNING TAILOR-MADE OR GROUP-SCHEDULED TOUR DEPARTURES. LOCATION is crucial; however a good location does not mean much if the property does not make the most of its setting and the activities it offers. We attempt to look for a wide range of activities led by highly qualified and knowledgeable guides. SERVICE and attention to detail are very important, ensuring that special Africa Easy experience. We have found, almost without fail, that the smaller properties have a distinct advantage when it comes to unobtrusive quality service. SECLUSION – A feeling of privacy and intimacy with the surroundings is another great advantage of the smaller camps and lodges. STYLE – Africa Easy also feels that style and comfort are important, favoring lodges, camps and hotels that are luxurious without being opulent. We have handpicked properties that are elegant and which complement their surroundings. GUIDES – It is important to have knowledgeable local guides sharing their expertise with you. Many factors influence where guides want to work but a few of the most important are concentrations of game, a happy team to work with and remuneration. Inevitably, the best guides want to work at the more high-end lodges and camps. REMOTENESS – The further from civilization a camp or lodge, the more expensive it is to supply and operate and the higher the access costs for guests. This is most evident in Namibia, home to some of Southern Africa’s most remote camps, e.g. Serra Cafema. CONVENIENCE – Camps and lodges with private airstrips close to camp offer increased convenience with shorter transfer times between the airstrip and camp. This means less time in transit and more time on safari or relaxing. Such airstrips, in addition to being expensive to build and maintain, are desirable to guests and attract a premium. Do take the time to explore the Africa Easy website and review the section on Southern and East Africa Highlights and then refer to the pages on South Africa, Southern Africa (Botswana, Zambia and Namibia) as well as East Africa (Tanzania and Kenya). Please don’t hesitate to call and or e-mail Africa Easy and speak to Nadia Eckhardt, an expert on Southern and East Africa. 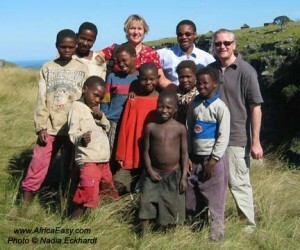 If you have any questions at all regarding your dream vacation to Africa, don’t hesitate to ask. It is important that you communicate with somebody who knows the areas well and who is well versed in all aspects of travel to Southern Africa. With Nadia’s vast experience in planning and guiding tours over the last few decades, there are few questions that she is unable to answer. If there is a question she does not feel confident to answer, she will get back to you with an appropriate answer, after consulting with her excellent contacts all around Southern Africa, within 24 or 48 hours. Whether you are attracted by the wildlife or cultural wealth of Southern Africa or any of the great natural wonders, or perhaps you are planning an adventure safari, the perfect romantic honeymoon, or a holistic African experience we will help you make your dreams a reality. We will listen to your requests and interests, and from there we will help you decide which parts of Southern or East Africa would best fulfill your aspirations, and then assist you in putting together the perfect itinerary. From the time you leave your home until you return, you will be taken care of by only the best local guides and operators, with impeccable records of reliability and safety. You will also be mailed, in your final document package, all local telephone number that you can call 24 hours a day should you require assistance. In short, you will continue to enjoy the type of service to which you have become accustomed during the planning stages as an Africa Easy traveler. Because of Africa Easy’s firsthand extensive experience and knowledge of the region, we are in the unique position to offer flexibility and a huge choice to our clients. We firmly believe that it is the personalized service and experience that set us apart from the competition. Others agree—many who have traveled previously with Nadia to myriad regions around the world have written in and said what a superb trip they had under her leadership and found their experience to have far exceeded their expectations.